The Canon EOS 4000D is Canon's new entry-level DSLR, sitting at the bottom of the range, designed to offer student photographers, or those on a budget an affordable Digital SLR. 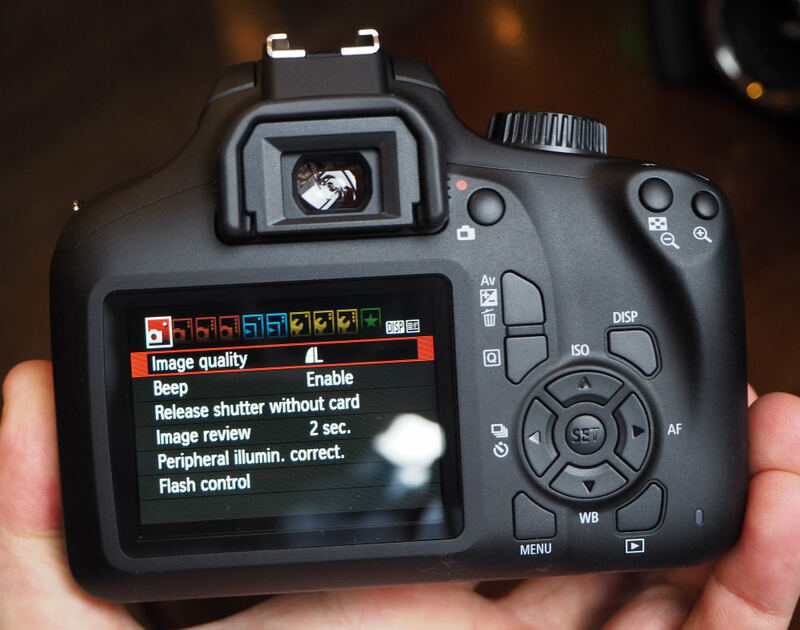 The 4000D features an 18 megapixel APS-C CMOS sensor, and built-in Wi-Fi for transferring photos. 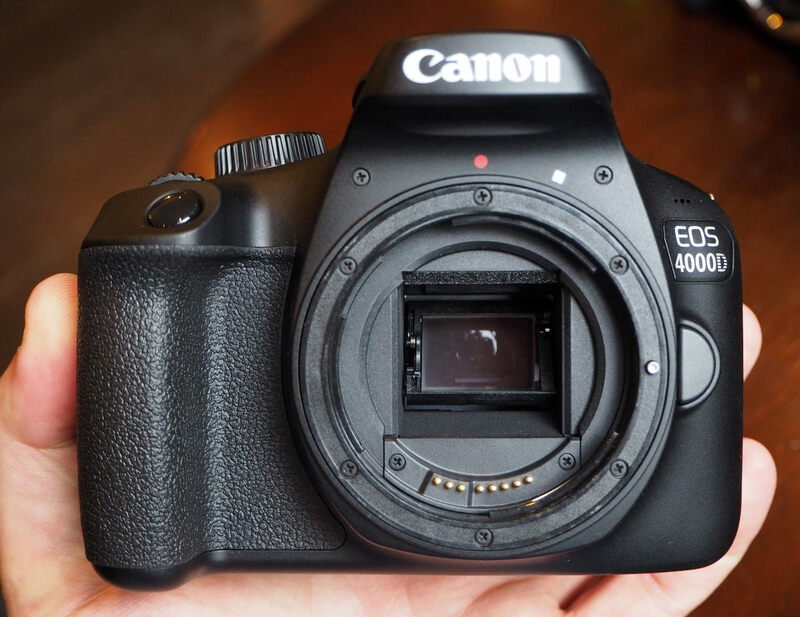 The Canon EOS 4000D replaces the 1300D, but with a lower specification and low-cost camera body. Unfortunately, the camera currently costs more than the model it replaces and there's little to like about the 4000D. The Canon EOS 4000D is Canon's new entry-level DSLR, sitting at the bottom of the range, designed to offer student photographers, or those on a budget, an affordable Digital SLR. The 4000D features an 18 megapixel APS-C CMOS sensor, and built-in Wi-Fi for transferring photos. The Canon EOS 4000D is available for £270 body only, or £360 with 18-55mm kit lens. 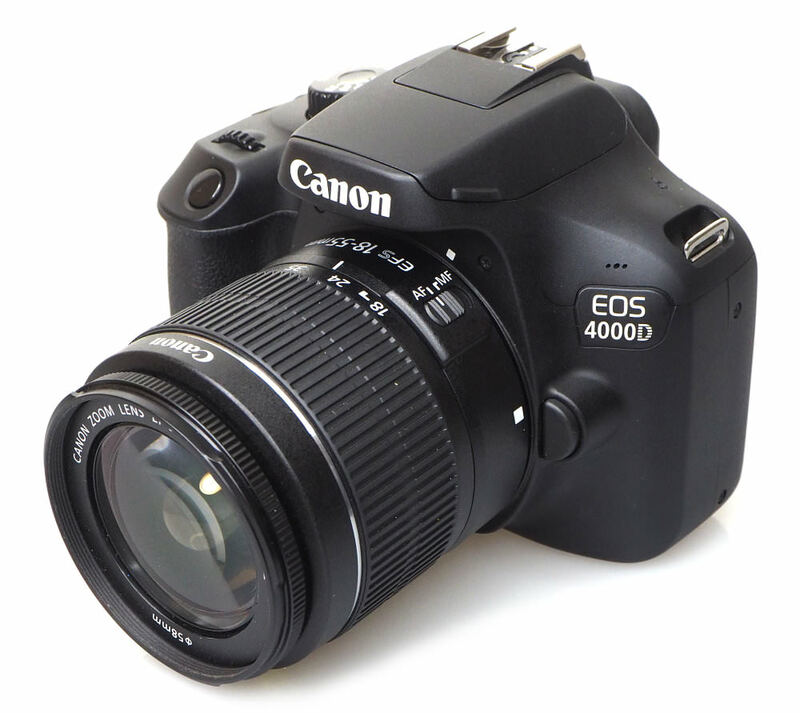 The Canon EOS 4000D isn't available in the US, or Japan, where it would normally have a different name, such as Rebel, or Kiss. 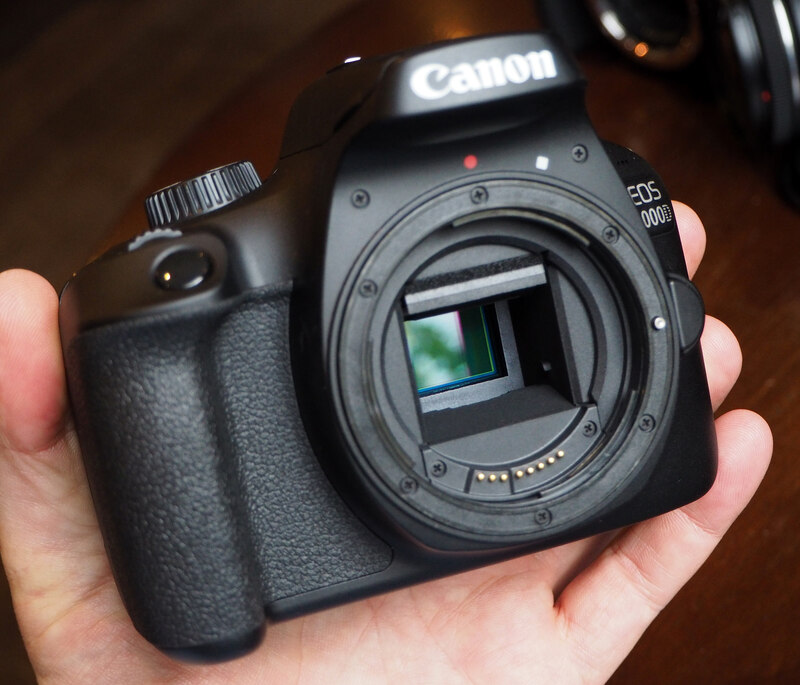 The 4000D uses an 18 megapixel APS-C CMOS sensor, the same sensor found in the 1300D. The 4000D has 9 AF points and shoots at 3fps, less than the Canon EOS 600D, which we reviewed in 2011. The new Canon EOS 2000D is introduced as the upper entry-level camera, with a 24-megapixel APS-C CMOS sensor, more refined camera body, and built-in NFC. 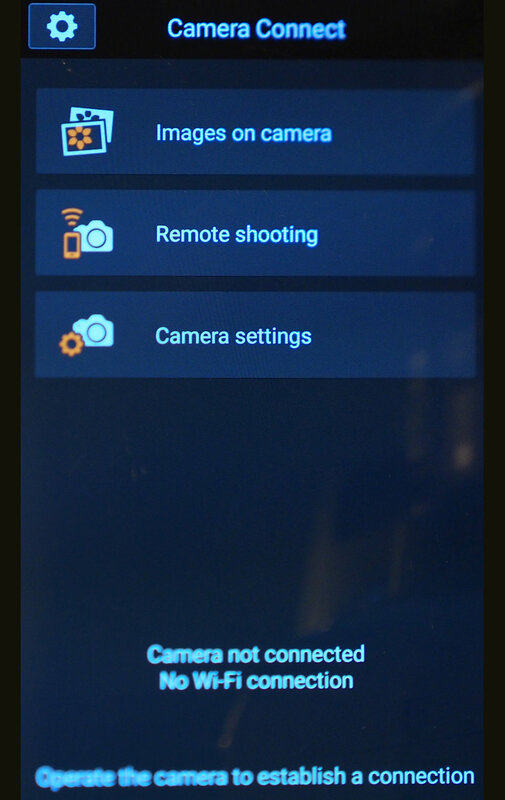 The camera has full manual controls, as well as scene intelligent auto mode, and a number of creative effects. 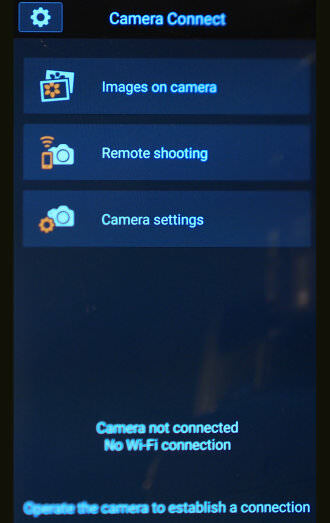 Built-in Wi-Fi makes the camera much more appealing for entry-level and younger shooters, which will make it quick and easy to connect to a compatible smartphone, transfer photos, as well as remotely control the camera. On the back, there is a 2.7inch screen, with 230K dots. The camera supports live view, so you can use the rear screen to compose and shoot photos, if you don't want to use the optical viewfinder. Continuous shooting speed is a rather sluggish 3fps, and the ISO range is the same as the 1300D, at ISO100 to ISO12800 (extended). The camera records FullHD video at 30,25,24fps, with mono sound, and there is no mic socket. The Canon EOS 4000D has access to all of Canon's EF and EF-S lenses, and when combined with one of the prime lenses, it becomes a quite compact Digital SLR and for those that want the smallest possible Digital SLR system. If you're looking for a compact lens to go with the 4000D, then there are a number of compact prime lenses available, such as the 24mm f/2.8 STM pancake lens, 40mm f/2.8 STM pancake lens, and 50mm f/1.8 STM prime lens. The Canon EOS 4000D is available body only, or with the 18-55mm III kit lens (which does not feature optical image stabilisation). If you're likely to want to shoot in lower light conditions, or for those that want to record hand-held video, then a lens with Image Stabilisation (IS) is going to help under these shooting conditions. The finish on the plastic is very basic, in comparison to the 2000D, which has a more premium, slightly textured finish, with neater seams. You'll be able to see some of the main differences between the design and build quality of the two cameras in the photo below, where you can see that even the command wheel is made using a cheaper plastic dial on the 4000D. There is a rubber grip for your hand, but this does not continue to the back of the camera. 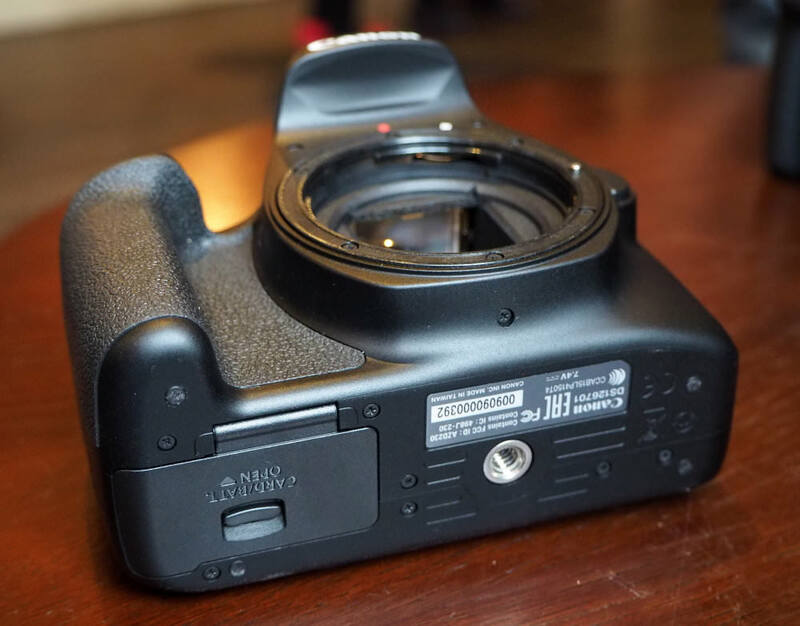 The memory card slot can be found under the camera, in the battery compartment. 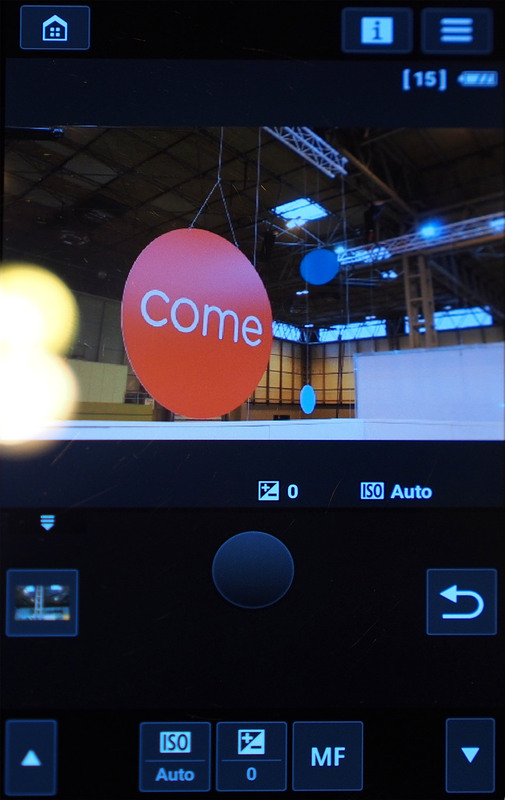 The mode dial is plastic, and is also used as the on/off switch, which makes the camera feel cheap. 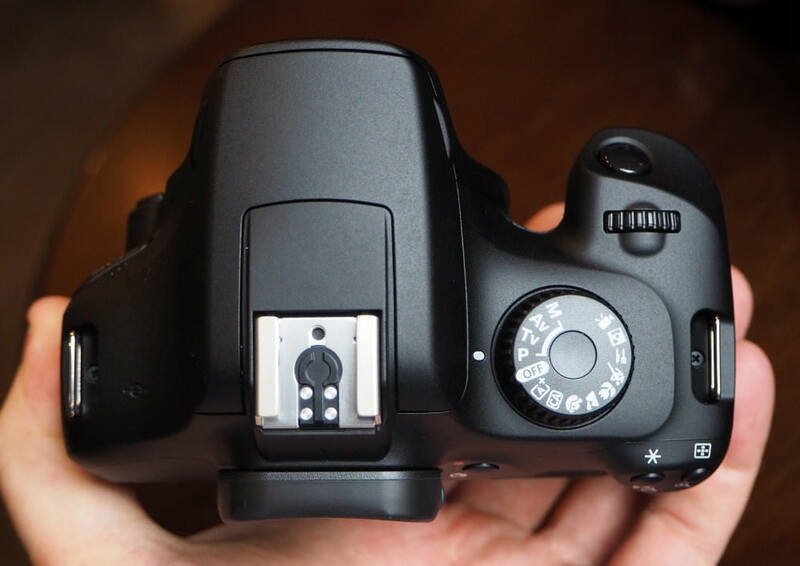 The layout of controls on the camera will be familiar to anyone who's used an entry to mid-level Digital SLR from Canon, such as the 1300D or 800D cameras. The buttons are clearly labelled next to the buttons (instead of on the buttons), and longevity of the labels may become an issue over time. The buttons are a good size, with easy access to a number of useful settings, including ISO, AF, WB and Drive mode on the 4-way controller. With good controls and a rubber grip at the front, however, there is no rubber at the back for your thumb, and the plastic camera body can feel quite cheap in your hand. There's also a plastic lens mount, this is likely to be an issue for some people, if you change lenses often, however, plastic can be quite strong, and plastic lens mounts have been used in the Sony Alpha A58 and A68. It's normally the mount or bayonet on the lens that breaks when a camera and lens are dropped, rather than the camera. The shutter sound is quite loud and noticable. You can watch a video of this here. The optical viewfinder has a soft rubber surround making it more comfortable to use. The optical viewfinder is clear and shows the focus points so that you know where the camera has focused. There are 9 focus points and these are quite central, which means you'll need to master focusing and re-composing if you want your subject off-centre. The optical viewfinder does not feature dioptre correction, so you'll need to look at another DSLR if you want this. The pop-up flash must be pulled up manually if you want to be able to use the flash. 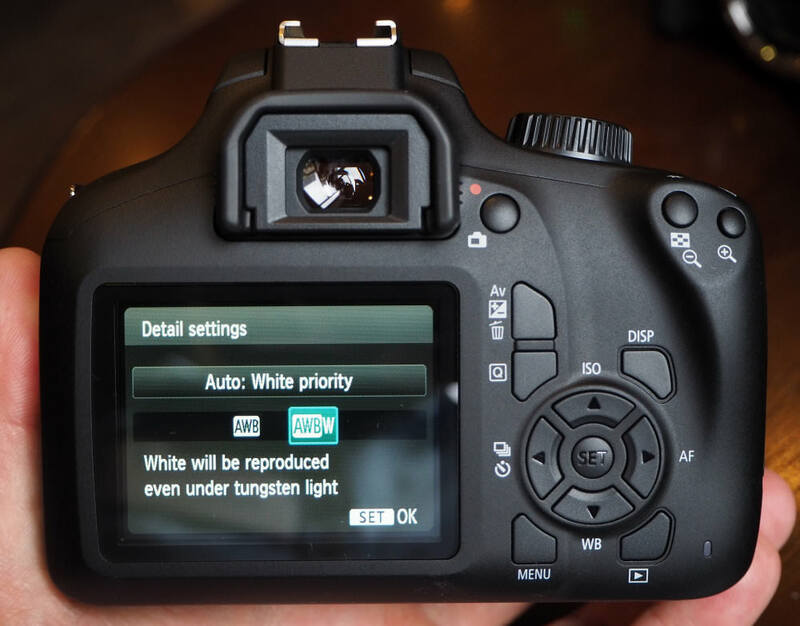 On other Canon EOS DSLRs, the flash will automatically pop-up when activated. Menus – The menus on the 4000D are well designed and easy to use with each main section colour coded and the screen is clear and easy to read. Although unfortunately, it's not a gapless screen. There's a Q button to give quick access to controls on the rear screen so that you don't have to go into the menus. Using Canon's Camera Connect app, (available for Android and iOS devices), you can view and transfer images on the camera, shoot remotely as well as change camera settings. The app will guide you through the steps needed to set up the connection. Battery life - Battery life is rated at 500 shots according to Canon / CIPA test results, which is reasonably good for a Canon Digital SLR, although other Digital SLRs sometimes offer longer battery life. The 4000D uses the LP-E10, the same as the 1300D and 2000D.